Fix code issues at condominiums near 31st Street and Main Street nearly left several people without a place to live. KANSAS CITY, Mo. — Residents at the Park Reserve Condominiums say they still feel unsafe one day after the Kansas City Fire Department told the property developer to get the buildings up to fire safety standards. 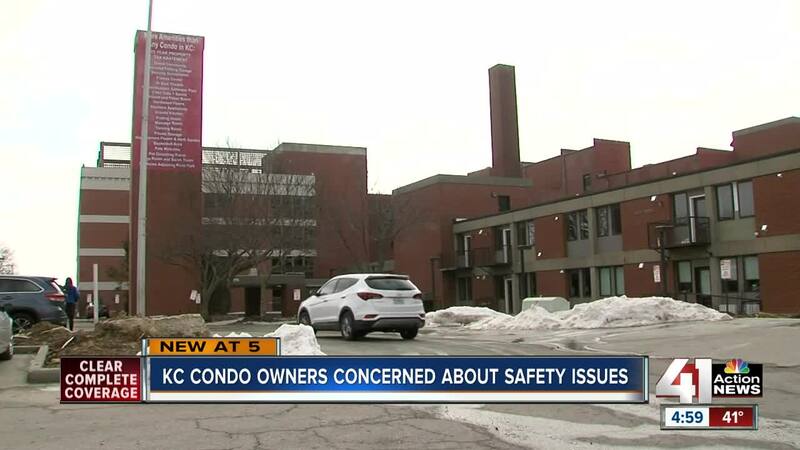 “My children were suggesting that I move in with them and honestly, I might go ahead and just do that because I still don’t feel safe,” condo owner Maryann Dubois said Friday. Firefighters on Thursday went to 2940 Baltimore Avenue and 2980 Baltimore Avenue, the Yellowstone and Grand Teton buildings, respectively. The fire department said residents complained about the broken fire alarm system last month. Dubois said residents were on edge to the point that they took shifts walking the property on a fire watch. Dubois said she set up a ladder just in case she had to suddenly evacuate the building if a fire broke out. KCFD Deputy Chief Jimmy Walker said after the property developer, Wayne Reeder, stopped communicating, the department had to set a March 7 deadline for him to fix the alarm system or people would have to evacuate. Martha Scholfield bought her condo two years ago. “You have no idea that the sprinkler system isn't installed and your unit might not have water behind it,” she said. KCFD said Reeder fixed the fire alarm after firefighters visited the property on Thursday. He has until March 20 to get the sprinkler system up and running. However, Walker said firefighters found multiple violations at the property. City records show the buildings failed multiple fire inspections over the last seven years. Reeder took out temporary occupancy permits for the buildings in the same time span, including a current one that expires April 1. Reeder did not respond to a request for comment. “This unit has been occupied for seven years. He needs to get it up to code and get a permanent occupancy license. That’s what I want,” Scholfield said. The Park Reserve Homeowners Association said it has received a long list of complaints, including the fire hazard. The association sent photos to 41 Action News of fire alarms and sprinklers covered with tape and leaks throughout the building, which appeared to be addressed with a bucket or sponge. “We have held up our end. The people here are such good, honest people and stay together,” Dubois said. The HOA filed a lien against Park Reserve LLC for unpaid dues. “Although developers can receive offsets for maintenance they provide, the homeowners say they haven’t been provided with any records of maintenance work allegedly performed between 2008 and mid-2018," one HOA board member said.